BERMTOPIA: When life hands you lemons. . . When life hands you lemons. . . If you are a fast reader, like me, chances are you're fast because you skim. That's not necessarily a bad thing. . . hey, you can read fast. . . but at least in my case, it gets me into trouble regularly on the culinary front, having skimmed over some critical ingredient or key step in the cooking process. Skimming is why I've had a 1-pound bag of lemons parked on my kitchen counter this week. I thought a recipe I was using for raspberry sorbetto called for a cup of fresh lemon juice. WHAT was I thinking??? That would be a whole new trip to PuckerVille. Instead the recipe called for a teaspoon. Him: What are you doing with all those lemons? Him: So what can you use them for? Me (eyes desperately darting around the kitchen for cooking ideas that could incorporate 10 lemons in the course of 3 days. . . eyes serendipitously land on the cookbook "Ciao Bella: Book of Gelato and Sorbetto." Of course. ): Sorbetto! Lemon sorbetto! I love gelato. Love it. And "Ciao Bella" is my gelato bible. Gelato is thick and creamy, infused with flavors, light but thick, custardly -- umm, ice cream on steroids. Discovered it in Italy, addiction enabled by Morelli's in Ellensburg, Wash. But sorbetto -- the Italian-fied version of sorbet -- is THE go-to during the summer. It's light, fresh and a great way to use quickly ripening fruit. Plus, making sorbetto is so stinkin' easy it's almost criminal -- pureed fruit, simple syrup and an ice cream maker. No cooking! If you don't count the 10 minutes or so prepping the simple syrup. Don't have an ice cream maker? Default to granitas -- the pureed fruit/simple syrup concoction goes into a baking dish. . . then into the freezer. . . then you periodically smush up things with a fork while it freezes. The ultimate snow cone! 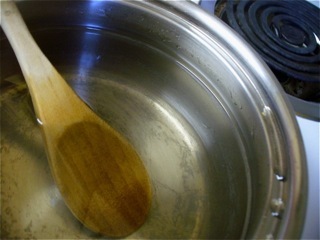 Here's how to make one batch of simple syrup: Stir together 1 cup sugar and 1 cup water in a saucepan, warm over medium heat, constantly stirring. You'll want the sugar totally dissolved -- you know that's happened when your liquid is clear -- and it will be, well, a little syrup-y. You can make more and store it for future sorbettos -- remember the ratio is 1 part water, 1 part sugar. But about this lemon sorbetto we've got going. . . . chill, chill and chill the lemon juice and simple syrup. And then get the ice cream maker out. Once suitably frigid, whisk together the lemon juice and simple syrup and start the ice cream maker. Most manufacturers recommend starting the machine, then adding your liquid. This is to avoid the creation sweet glaciers of epic proportions in your ice cream canister. Churn away till you have sorbetto. (Just follow the owner's manual on this one.) Place the finished product in a seal-able container and freeze for a couple hours before serving. 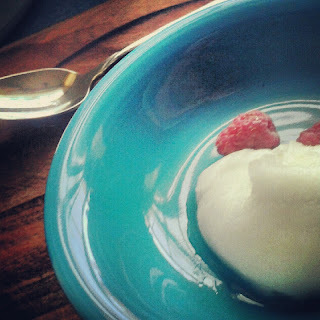 There are dozens of recipes for sorbetto (aka, sorbet) online and in cookbooks. And skim to your heart's content. P.S. Sorry about the poopy photos -- iPhoto and Blogger currently aren't speaking to each other.